Cuteness Overload!!! Blizzard gave PTR testers a bunch of pets to test out. Things like the new darkmoon pets, and the cinder kitten. 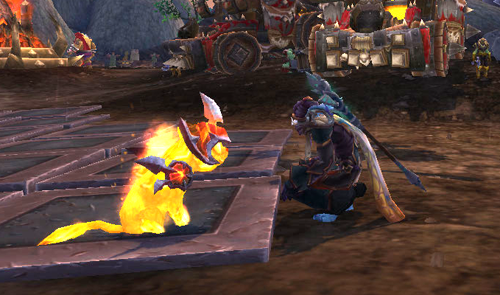 The Cinder Kitten isn’t just a cute pet it is a rare Elemental Battle Pet. Level 1: Claw – Claws the enemy dealing 30 Beast damage. Good vs Critters, Bad vs Flying. Level 2: Immolate – Deals 16 Elemental damage instantly plus 7 more elemental damage per round for 4 rounds. Good vs Mechanical, Bad vs Critters. Level 4: Prowl – Reduces your speed by 30% and increases the damage on your next attack by 150%. Level 10: Rend – Lashes the enemy 1-2 times dealing 15 Beast damage per lash. Attacks an additional time if the user attacks first. Level 15: Scorched Earth – Scorches the ground dealing 37 Dragonkin damage plus 6 Dragonkin damage to all active pets per round for 9 rounds. During scorched earth all pets count as burning. Level 20: Leap – Instantly deals 22 Beast damage and increased speed by 100% for the next round.